Most women I know wear makeup and end up carrying some cosmetics in their purse and a lot more when they travel! 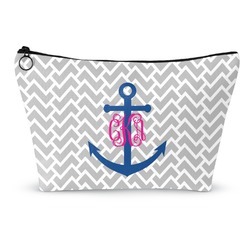 So if you are like most women, then why not carry your cosmetics in makeup bags that reflect your personal style? These makeup bags are also perfect for gift giving. Our bags are made from soft & durable canvas; have a black fused lining and have a gusset (see photo of side view) on the bottom so you can fit a lot of items in the bag. Our makeup bags are offered in 2 size - the small is approximately 8.5W x 4.5H x 2D and is perfect for your purse or to carry jewelry when you travel. The big one is approximately 12.5W x 7H x 2.5D and is perfect for all your makeup. 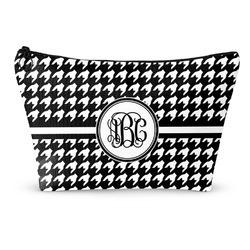 Browse our cosmetic bags and see if there is one you like. Start there and customize to your liking; you can change as little as just the colors and the personalization or you can browse our customization system for additional template styles, backgrounds, labels, ribbon & personalization styles. Create something that truly reflects your personality. Not finding what you have in mind? Contact us and we will do our very best to accommodate you! You may enjoy our travel accessories section and also our luggage & bags section for personalized suitcases & backpacks, You may also be interested in our Handbags & Wallets category. 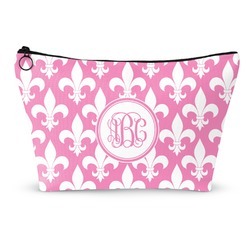 This product is pretty but the monogram seems a bit faded. Best gift ever!!! My duaghter loved it. Thank you.. This is a really cute bag. I actually added a ribbon strap to make it a small crossbody purse and it looks really good. I ran the ribbon all the way down both sides. This bag is really nice, but the zipper does not properly work. Otherwise, I would give it 5 stars.